A national issue has been raised recently, albeit on rather unconventional terms. Miss Philippines-Earth 2016 candidate and Miss Zamboanga Bellatrix Tan must have not seen this particular line of questioning—about El Niño and La Niña—coming during the pageant's question and answer segment. Tan has already aired her side on the now-viral gaffe, making it clear she is aware of what the two things meant, and that it was just a bad case of the onstage jitters. "I know po talaga yung El Niño and La Niña. Kasi alam ko po talaga na yung El Niño, drought po, dry. Sa La Niña naman po, heavy rainfall," she explained in an interview with DZMM. "Kasi nung na-realize ko na mali pala yung pag-deliver ko, yung pag-answer ko, bigla pong nag-react na ako." Too late though, as the ever-judgmental and borderline bullying social media has already poked fun at Tan's answer. Although if you think about it, do you, yourself, know enough about these extreme climate patterns—other than associating it to the need to bring an umbrella or not? Apparently, there is more to El Niño and La Niña than just cracked earth and inundated fields. In an etymological sense, El Niño means "little boy" in Spanish, while La Niña translates to "little girl." We aren't so sure about the connection of these catastrophic episodes to juveniles, but once you capitalize the word, El Niño apparently also means Christ Child, which makes sense because the timing of these occurrences is around December or Christmastime. La Niña, being its counterpart, is also called anti-El Niño and El Viejo (the old man in Spanish). 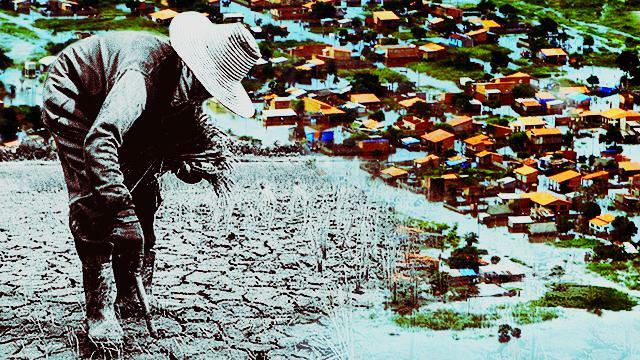 Fishermen off the Peruvian coast first noticed El Niño in the 1600s, and Spanish immigrants were the ones who christened the then-unidentified anomaly. According to the National Geographic Society, El Niño "describes the unusual warming of surface waters in the eastern tropical Pacific Ocean." La Niña, on the other hand, "describes the cooling of surface ocean waters along the tropical west coast of South America." Despite being polar opposites, El Niño and La Niña are actually related, in that both are part of a larger phenomenon called the El Nino-Southern Oscillation (ENSO), a "climate pattern in which coastal waters become warmer in the eastern tropical Pacific, and atmospheric pressure decreases at the ocean surface in the western tropical Pacific." While ENSO is now almost interchangeable with El Niño, La Niña refers to its "cool phase." The problem arises when either El Niño or La Niña disrupts the temperature in the Pacific Ocean, which then affects atmospheric pressure, global atmospheric circulation, and more importantly, rainfall patterns. Ostensibly, the severe heat brought upon by El Niño parches paddy fields and crops, inducing stroke to farmers and their pockets. What most people don't know is that before or after such dry spells, bouts of rain should also be expected. Notably, a local desiccation can also coincide with downpour overseas. Case in point: The first scientifically monitored El Niño event from 1997-98 dried up in the country, and Asian neighbors Indonesia and Malaysia. Peru, meanwhile, experienced heavy deluge. El Niño being a double-edged sword doesn't mean La Niña is lesser of an evil. Floods and landslides are just some of the life-threatening consequences irregular storms pose. Although it is also said that La Niña has her "benefits," like "upwelling," which brings cold, nutrient-rich waters to the surface and supply food for majority of marine life. What makes both climate patterns more dangerous are its unpredictable nature, regardless of how much modern technology offers. Basically, we're talking casualties here, so you might want to hold off on the giggles.